With a range of stunning, slender and stylish displays, our AOC monitors bring computing to life. They offer jaw dropping resolution made for fine-tuned graphics work, spectacular gaming and movie streaming. AOC monitors offer a level of style, build quality, features and performance that exceed their entry-level price tags. Our AOC monitor range is available in a selection of sizes, from 19.5” to a huge 34”, so whatever your needs you can find a monitor that delivers. As for resolution, you can expect nothing but spectacular results; our minimum AOC screen resolution is 1600 x 1900p HD+, and all models are wall mountable too. 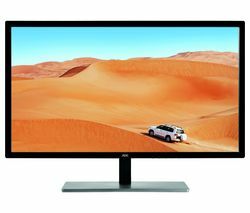 The majority of AOC monitors offer Full HD, while larger models pack in either Quad HD (3440 x 1440p) resolution – four times the quality of standard HD – or 4k Ultra HD (3840 x 2160p). Featuring HDMI, VGA, DVI, USB 2.0, USB 3.0 and Display Port inputs for ultimate connectivity, MHL-enabled models allow you to connect your smart device for easy charging and streaming. Most models come with built-in speakers, but audio inputs mean plugging in your own dedicated sound system is never a problem. For superior display power at a price you can afford, AOC monitors are the ideal computing solution. For even more display options, check out our full range of pc monitors, including our extensive HP monitors range.